I'm not going to bother with preamble. The Impressionist Gardens exhibition at the National Gallery of Scotland is brilliant. It's a thoughtfully curated collection of works leading up to and including the whole Impressionist period, covering gardens and natural outdoor spaces. Quite broad, you would think, and yes: there is a wide range of subject matter, but all showing fine examples of the Impressionists' use of colour and warmth to generate atmosphere. 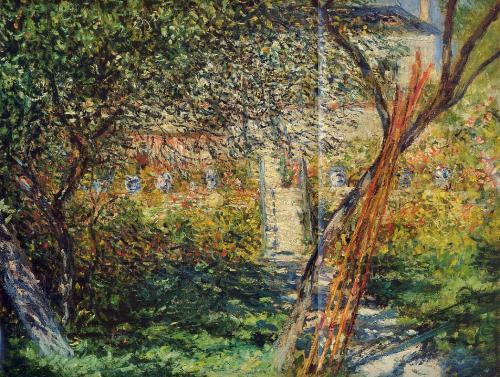 The first room, Towards the Impressionist Garden, explores some of the work pointing towards the techniques and styles that the Impressionists proper would use, and an increasing obsession with the natural world. The vibrancy and sensuality of Eugene Delacroix's Still life with flowers (1834) - a rust-coloured background highlighting the heady flowers. I also loved Corot's Parc des Lions at Port Marly (1872) with its silver birches dividing a brother and sister. The largest room displayed a variety of Impressionist works. One that made a real impression on me (sorry) was American painter Mary Cassatt's Summertime (1894) with wonderful depiction of a young girl's shoulder being the highlight. Even more striking, although rather hideous in some ways, was Leon Frederic's The fragrant air; it's not a beautiful depiction of a child, but you can feel the warm air, the smell of the roses, the innocence of the child. It's a startling work. 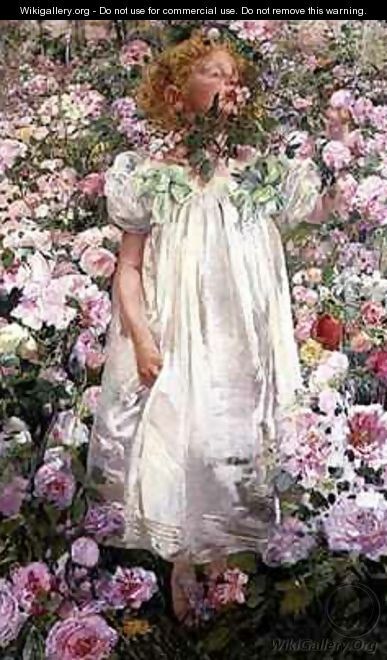 A name new to me was Gaston La Touche; his painting Phlox is a celebration of whites and lights, the sunlight peeking through the leaves and bouncing off the flowers and dresses. What surprised me was that although there are only a handful of works by the blockbuster names (Monet, Renoir, Manet, etc), the exhibition does not suffer one bit and there is absolutely no feeling of there being and "filler" (which was the problem with the Impressionism & Scotland exhibition at the same gallery a couple of years ago when they padded out the good stuff with a load of Scottish stuff from their own collection). Indeed some Scottish works were amongst the highlights: Arthur Melville's A cabbage garden (1877), placed later within the utilitarian and market gardens section, was one, with its gardener knee-deep in blue-grey cabbages. Belgian James Ensor's The garden of the Rousseau family (1885) also sits in this section, a real magical feeling, not to mention the spooky cabbages looking like eyes. It can't be said that the blockbusters aren't among the highlights, however. Sitting in a row in the main room are two Monets and a Renoir. Monet's The artist's garden at Argenteuil (a corner of the garden with dahlias) (1873) is an arresting piece: soft light and clouds (the weather has a very British, changeable feel) provide the background, with trees smudging into the sky. The viewer's eyes are drawn into the foreground where vibrant dahlias burst out of the canvas. The garden at Vetheuil, from eight years later, is overwhelmingly busy, with dense layers of dark colours. Renoir is represented by Woman with parasol in a garden, which features a striking dark figure in the background, surrounded by lush vegetation, almost like a jungle. It's this lush greenery which got me thinking, was there much Impressionism in Ireland, particularly in the southwest? The sheer lush intensity of the vegetation in parts of Cork and Kerry, where it's so warm and wet, would seem like ideal targets for French Impressionists, not to mention any local painters. Other highlights included a Gauguin (Skaters in Frederiksberg Gardens, 1884) where the red autumn leaves highlight the coldness of the ice; Monet's pair of paintings of The parc Monceau in Paris, where he deliberately avoids the brilliant parts to concentrate instead on a shadowy corner; and The rainbow (1896) by Leopold Graf von Kalkreuth, who captures the feeble white sunlight contrasting the dark clouds perfectly. Serene figures shiver as they contemplate the rainbow. Camille Pissarro is represented by The cote des boeufs at L'Hermitage, 1877, with its winding poplar trees which draw the viewer's eyes from one side to the other in a zigzag motion, and by the perfectly proprtioned The artist's garden at Eragny, also from 1877. The final rooms, featuring later Impressionist works, are the most dreamlike and fantastical of all. Nature gets sinister with Van Gogh's Undergrowth while a couple of Monet's most misty, dimensionless waterlily works are also exhibited. Henri Le Sidaner - another I'd never heard of - made a wonderful piece called An autumn evening in 1895: an air of soft beige mystery surrounding a woman walking alone at gloomglow in profile. Meanwhile, Joaquin Sorolla y Bastida's The garden of Sorolla's house (1920) is idyllic, with luminist shimmering perfection in a garden framing a dazzling white chair. It's an extraordinary work. Another Van Gogh work, the rather stark, raw Garden with path (1888) feels almost harsh and uncouth by comparison to the earlier lushness (presumably what contemporary critics felt as well!). The very best is left until last, however, with works of rose gardens on the final wall - four heady, indolent washes of colour and texture: Klimt's Rosebushes under trees is one highlight but my favourite of all is the very final work - another one by Le Sidaner: The rose pavilion, Gerberoy (1938) is a wonderfully evocative work of colour and beauty.